Qena is a city in Upper Egypt, and the capital of the Qena Governorate. Kick off your visit on the 1st (Fri): contemplate the long history of Temple Khatkhor, then explore the ancient world of Temple of Hathor at Dendera, and then explore the ancient world of Dendera Temple Complex. Plan my day in Qena using traveler tips and tourist information provided by Inspirock. Cairo to Qena is an approximately 4-hour combination of flight and taxi. You can also drive; or take a bus. When traveling from Cairo in March, plan for somewhat warmer days in Qena, with highs around 35°C, while nights are about the same with lows around 16°C. Cap off your sightseeing on the 1st (Fri) early enough to go by car to Luxor. Luxor is known for historic sites, museums, shopping, parks, and nightlife. Your plan includes some of its best attractions: delve into the distant past at Temple of Karnak, pause for some photo ops at Luxor Temple, stroll the grounds of Valley of the Queens, and contemplate in the serene atmosphere at Medinet Habu. To see reviews, more things to do, photos, and tourist information, use the Luxor trip planner. Drive from Qena to Luxor in 1.5 hours. In March, daytime highs in Luxor are 35°C, while nighttime lows are 16°C. Cap off your sightseeing on the 8th (Fri) early enough to catch the train to Edfu. Edfu is an Egyptian city, located on the west bank of the Nile River between Esna and Aswan, with a population of approximately sixty thousand people. Start off your visit on the 9th (Sat): delve into the distant past at Kanais and then delve into the distant past at Temple of Horus at Edfu. For other places to visit, traveler tips, ratings, and more tourist information, refer to the Edfu trip tool . Getting from Luxor to Edfu by train takes about 1.5 hours. Other options: drive. In March, daily temperatures in Edfu can reach 35°C, while at night they dip to 16°C. Finish your sightseeing early on the 9th (Sat) to allow enough time to travel to New Valley Governorate. New Valley Governorate is one of the governorates of Egypt. New Valley Governorate is known for nature, historic sites, museums, and shopping. 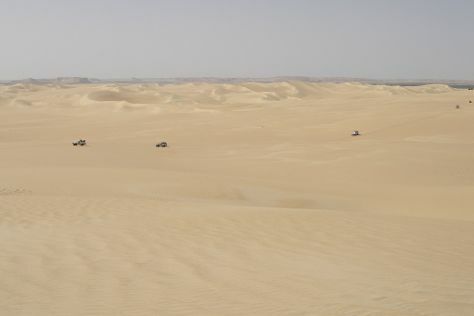 Your plan includes some of its best attractions: admire nature's extreme beauty at Sahara Desert. For where to stay, maps, ratings, and more tourist information, go to the New Valley Governorate travel route tool . Use the Route module to find suitable travel options from Edfu to New Valley Governorate. On the 12th (Tue), you'll travel to Abu Simbel. Start off your visit on the 13th (Wed): steep yourself in history at Abu Simbel Temple Complex. Make your Abu Simbel itinerary with Inspirock to find out what to see and where to go. Explore your travel options from New Valley Governorate to Abu Simbel with the Route module. Expect a daytime high around 35°C in March, and nighttime lows around 17°C. Wrap up your sightseeing by early afternoon on the 13th (Wed) to allow enough time to travel to Aswan. Step out of Aswan to go to Kom Ombo and see Temple of Kom Ombo, which is approximately 1h 05 min away. There's lots more to do: explore the ancient world of Philae Temple, step off the mainland to explore Kitchner's Island, don't miss a visit to Aswan Sculpture Park, and get engrossed in the history at Nubian Museum. To see photos, ratings, maps, and tourist information, go to the Aswan online road trip planner . Traveling by combination of flight and taxi from Abu Simbel to Aswan takes 1.5 hours. Alternatively, you can drive. March in Aswan sees daily highs of 36°C and lows of 18°C at night. Finish your sightseeing early on the 18th (Mon) so you can drive to Marsa Alam. Marsa Alam is known for wildlife, beaches, outdoors, adventure, and spas. Your plan includes some of its best attractions: get a new perspective on things with Seaworld Diving Center, get outside with Vivasub diving center, stroll through Marsa Mubarak, and soak in style at Turkish baths. To see reviews, ratings, other places to visit, and other tourist information, use the Marsa Alam trip builder . Getting from Aswan to Marsa Alam by car takes about 5.5 hours. Other options: do a combination of train and bus. Traveling from Aswan in March, you will find days in Marsa Alam are slightly colder (30°C), and nights are about the same (20°C). Wrap up your sightseeing on the 24th (Sun) to allow time to drive to Hurghada. Spend the 25th (Mon) among aquatic life with a scuba or snorkeling tour. On the 30th (Sat), spend a thrilling day on the water with a speed boat tour. There's much more to do: look for all kinds of wild species at Wildlife Areas, buy something for everyone on your list at Senzo Mall, go for a stroll along the water at Hurghada Marina, and have fun at Lax Gym. Plan my trip to Hurghada with suggested itineraries provided by Inspirock. Traveling by car from Marsa Alam to Hurghada takes 4 hours. Alternatively, you can do a combination of taxi and flight; or take a bus. Expect a daytime high around 32°C in March, and nighttime lows around 18°C. Wrap up your sightseeing on the 31st (Sun) to allow time to travel to Sharm El Sheikh. Spend the 1st (Mon) among aquatic life with a scuba or snorkeling tour. There's lots more to do: browse the different shops at SOHO Square, head outdoors with Subacquei Clandestini CCF Sharm, take a pleasant ride with Miso Horse Riding Trips, and enjoy the sand and surf at Shark's Bay Beach. To find other places to visit, photos, traveler tips, and tourist information, go to the Sharm El Sheikh trip itinerary maker . You can do a combination of bus and flight from Hurghada to Sharm El Sheikh in 1.5 hours. Alternatively, you can ride a ferry; or drive. March in Sharm El Sheikh sees daily highs of 32°C and lows of 21°C at night. Finish your sightseeing early on the 7th (Sun) so you can drive to Dahab. Take a break from Dahab with a short trip to Salah El-Din Castle in Taba, about 1h 55 min away. Spend the 8th (Mon) among aquatic life with a scuba or snorkeling tour. Make the 12th (Fri) an unforgettable day with an extreme tour. There's much more to do: Head underground at Blue Hole, head outdoors with Blue Lagoon, take in the exciting artwork at WICKEDiCANDY, and indulge in some personalized pampering at some of the best spas. To see other places to visit, ratings, maps, and other tourist information, go to the Dahab day trip planner . Traveling by car from Sharm El Sheikh to Dahab takes 1.5 hours. Alternatively, you can take a bus. In April, daily temperatures in Dahab can reach 36°C, while at night they dip to 25°C. Finish your sightseeing early on the 13th (Sat) so you can drive to Saint Catherine. On the 14th (Sun), explore and take pictures at The Cascades at Soma Bay and then visit a coastal fixture at Daedalus Reef Lighthouse. On the 15th (Mon), you'll have a packed day of sightseeing: contemplate in the serene atmosphere at St. Anthony's Monastery (Deir Mar Antonios), then admire all the interesting features of Mount Sinai, and then take in the spiritual surroundings of St. Catherine's Monastery. To see traveler tips, other places to visit, where to stay, and more tourist information, refer to the Saint Catherine online travel planner . Getting from Dahab to Saint Catherine by car takes about 2.5 hours. Other options: take a bus. Traveling from Dahab in April, expect Saint Catherine to be slightly colder, temps between 28°C and 13°C. Wrap up your sightseeing on the 15th (Mon) early enough to travel to Alexandria. You'll find plenty of places to visit near Alexandria: El Alamein (Deutsche Kriegsgraeberstatte & El Alamein War Cemetery). 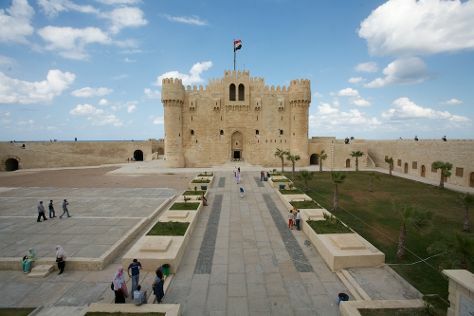 There's still lots to do: admire the masterpieces at Bibliotheca Alexandrina, get engrossed in the history at El Kobba El Samaweya, take in the spiritual surroundings of St.Mina Monastery, and delve into the distant past at Pompey's Pillar. For traveler tips, other places to visit, where to stay, and more tourist information, read our Alexandria trip itinerary maker website . Traveling by combination of taxi and flight from Saint Catherine to Alexandria takes 5 hours. Alternatively, you can drive; or do a combination of taxi, flight, and bus. In April, daily temperatures in Alexandria can reach 29°C, while at night they dip to 17°C. Finish your sightseeing early on the 21st (Sun) to allow enough time to take a bus to Cairo. Venture out of the city with trips to Giza (Pyramids of Giza, Great Sphinx, & more). Spend the 25th (Thu) behind the viewfinder with an inspiring photography tour. The adventure continues: examine the collection at Egyptian Antiquities Museum, appreciate the extensive heritage of Old City (Coptic Cairo), take in the spiritual surroundings of Mosque of Al-Azhar, and admire the landmark architecture of Hanging Church (El Muallaqa, Sitt Mariam, St Mary). To see ratings, where to stay, more things to do, and tourist information, read Cairo day trip app . You can take a bus from Alexandria to Cairo in 2 hours. Alternatively, you can drive; or fly. Expect a bit warmer weather when traveling from Alexandria in April: highs in Cairo hover around 33°C, while lows dip to 19°C. Cap off your sightseeing on the 29th (Mon) early enough to travel back home.